My weekend ends on Monday and I was finally able to sit and stitch for a while so I will share my progress. 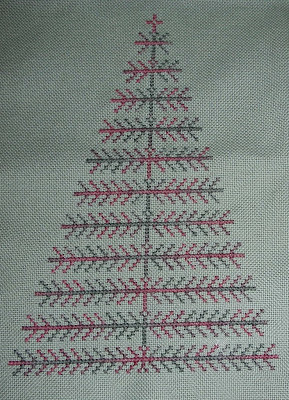 I stitched Just Nan's 12 Days of Christmas, well not the whole thing just Day 1. And actually it is missing the #8 Perle Cotton(the #1 is to be stitched in this) that I just picked up today and a little Kreinik Blending Filament that I have to order. I will share that I am not happy with this almost finish. The JN models were stitched in silks but offered a DMC conversion which is what I used. But, this is stitched on 32ct Flax Belfast with two strands and the 2 strands of DMC seemed fairly bulky. Today I pulled Needlepoint Inc silks from a DMC to NPI conversion I found and I will try them on the Day 2 design (in February) and then decide which way the rest will be stitched. I did receive the Prairie Schooler leaflet I was waiting for, it's from an eBay auction because it is an out of print chart, book no. 20 called St. Nicholas. I even made a small start on one of these which will be the set I do for my DS. I am stitching over one on 18ct Khaki Davosa as recommended so these will be about 3" x 2 1/2", which I will finish into little hanging pillows as they are shown. 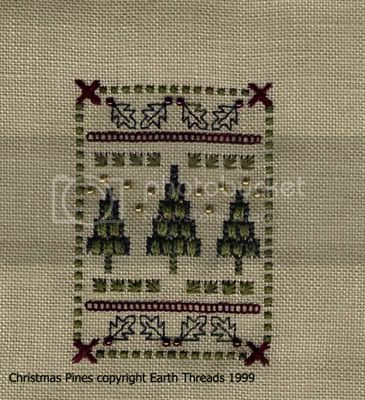 This is Pear Tree by Diane Williams of Little House Needleworks. Pattern in JCS Orn magazine - 2006. I want to show you my first ornament of this year. It's a Christmas Tree from The Prairie Schooler. The fabric is Jobelan 28c and the floss Dinky Dyes. I want to make three of this Trees. I'll show you when I finish them. I'm very happy to belong to this SAL Group. I managed to stitch two ornaments this weekend and started two others (I am what should be known as a SASS--Short Attention Span Stitcher). I used Dinky Dyes silks for both the finished ornaments this month and just pulled from my stash. The first is a freebie from The Cat's Whiskers. I used the recommended Dinky Dyes Silks with the exception of using Icy Rose (from the Winter 2007 Limited Edition Pack) for the Merlot. I also did not use the silver BF because: 1. I really hate BF and 2. I want to find a small crystal star rather than the silver sequin star because I think the crystal will last longer. It is stitched on 32 count Little Boy Blue linen. My second finish is "God Bless Us Every One!" 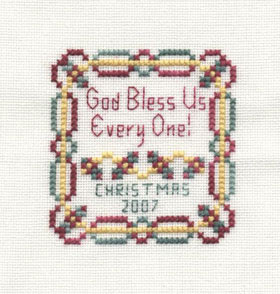 by A Stitch and a Prayer which can be found in the December 2006 issue of The Gift of Stitching. My Step Father usually plays an abridged audio recording of Dickens's "A Christmas Carol" on Christmas Eve and I thought it would be nice for either him or my Step Sister. I did not have the Ozark Sampler threads on hand so I substituted Dinky Dyes # 112 Banksia for the yellow, #58 Kayla's Roses for the red and #96 Christmas Pines for the green. I thought it turned out very nice. I plan to finish them into ornaments once I've made a few more. As I said, I have two more started and I've already picked four or five more ornaments to stitch next month. I am tempted by many of the designs that have been posted and I have a few on order. Everyone has stitched beautiful ornaments. I'm looking forward to next month's SAL but for now, it's back to my regularly scheduled stitching! What wonderful ornaments everyone has stitched so far, I've had to add several to my already very long 2007 list, lol, as they look so great. Thanks to Nicki and Anne for setting this up, looking forward to next month's SAL already. 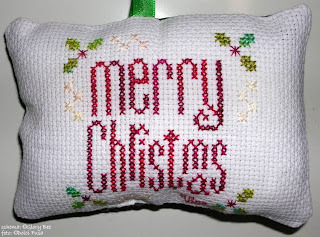 Here is my ornament for January - this had a lot more stitching than at first glance! LOL Lucky for me I had lots of time to stitch in the weekend, I put the date and the last little bit of border on it yesterday. Thank you for having this group! My husband thought it was a little strange for me to be stitching an ornament in January... but, when I explained the concept to him, he thought it was a neat idea! For my first effort... 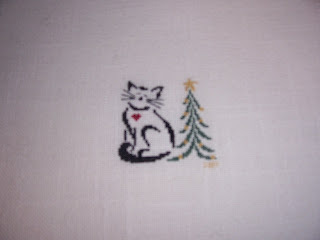 I chose 'Britty Christmas Kitty' by Brittercup Designs, that was in the 2005 JCS Ornament Issue. 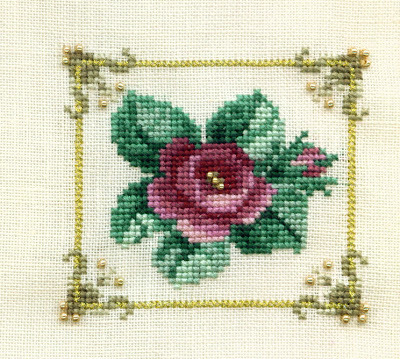 I stitched it over one, and used DMC, and changed the colors a little bit, on a white 28 ct. linen. It's a bad picture, but, it's not sunny here, and I had a little black kitty wanting to help me take pictures! I'm already on the lookout for my next month's ornament to stitch! Had a wonderful time stitching my first Christmas Orni! actually, this is the first one that I've ever stitched in my life! I can definitely see that there will be some monthes that I stitch more than one! I'm so glad this SAL was started! It felt a bit strange stitching a Christmas ornament in January, but I actually rather liked it :) And I know I'll be very very happy in November and December! Here's the ornament I made this weekend. 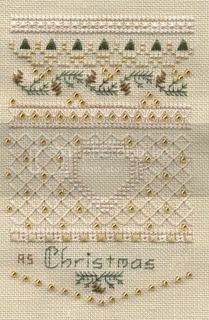 It's from the 2002 Just Cross Stitch Ornament Issue and it's by Heart In Hand Needleart. I chose my own colors and ended up using DMC and Gentle Arts Sampler Thread. I haven't yet finished it into an actual ornament. I think I'll do a marathon ornament sewing evening sometime in November. For January I had planned on doing something a little bigger but I was short on time over the weekend so I decided to do something a little less stitch intensive. 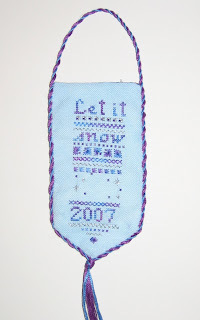 So here is my Christmas Heart from La-D-Da from the 2005 Just Cross Stitch Ornament issue. I did it on Silkweavers 28 count Heritage 1 over 1 (my first 1x1 project!) using the recommended fibers. It's so tiny! I just love it. Its great seeing everyone's ornaments! Here is my confession: I didn't get mine finished! 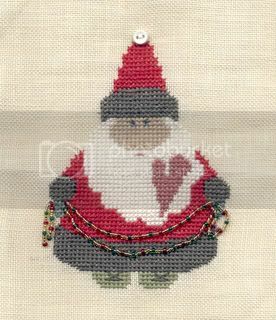 I decided to work on Prairie Schooler's 2005 Santa ~ the one holding the quilt, which I've been anxious to do for a while. 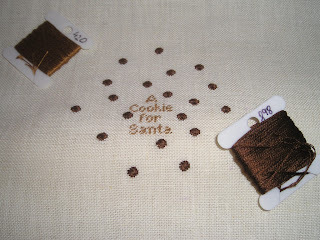 I'm using a 20 ct khaki lugana and I have enough fabric to do 3 of the Santas. I started him on Friday night and by last night only had most of his coat filled out. So it looks like he's going to be making a reappearance at the February SAL weekend and hopefully get finished then too! I'm going to do the finishing on this one when I have a couple more done so all the Santa's look the same! Well, this one seemed to take forever to do, and I haven't done the finishing, but here's my ornament for the SAL. Cute isn't he?! 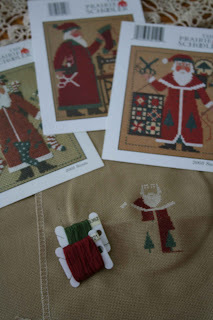 It's Santa Star by Lavender Wings from the 2002 JCS ornament issue. I didn't do all the backstitching as I didn't think it added anything (and I hate backstitching!) and I left off the stars as I want to make it into a star-shaped ornament. 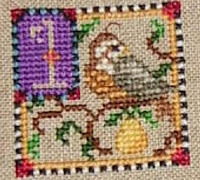 It's stitched on a bit of Silkweaver linen from a treat bag - I think it's 28ct. goodness i actually finished one on time!! 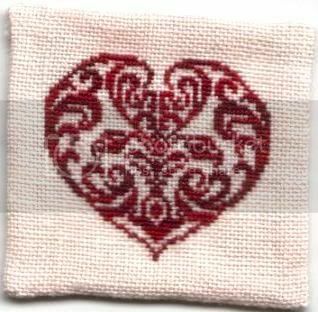 it is the centre heart from AMAP i Give you five Hearts, stitched 1x1 on 32 ct porcelain linen from silkweaver in Gloriana Cranberry. I am actually finishing it into a fob ..
Well, I just squeeked a finish with this stitching, it's been a busy weekend and it's now 11pm here! Granted it's not a very original choice but I'm really pleased with it, it's a simple design so I didn't change anything as I felt it was best to leave it plain. This is my first SAL and I've really enjoyed seeing everyone else's posts and being part of it. Hi everyone. This is my first January ornament. It´s vom JCS 1999. I stitched it with DMC 898 & 420. It was a fun stitch. This is my January ornament. It's called The Berry Bird by Theron Traditions. It's from JCS 2000 Christmas Ornament magazine. I changed the red Palestrina knots and used beads instead to give it a little glitz. I used a metal finishing form and stitched the date on the back. This was so much fun and I'm looking to see what I want to stitch for February's SAL already. Thanks Nicki for putting this SAL together!!! My first ornament for the SAL! Yay..I'm in! 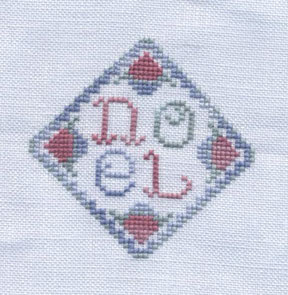 It's a long weekend here in Australia (Friday being the holiday) so I took advantage of it to stitch this ornament. 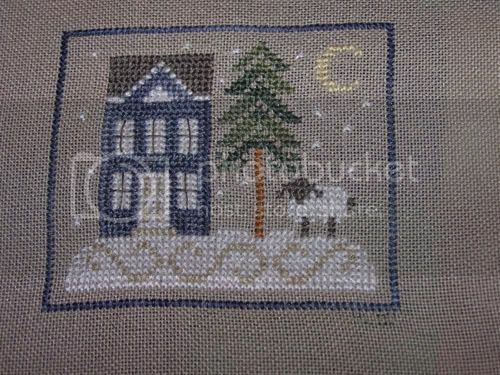 It's Winter's Eve by Country Cottage Needleworks. Oh, it's me..Alison in Oz! Not sure yet how I will finish this. I looked through my fabrics and I don't see a finishing fabric I like for this right now, and the stores around here do not have a lot of Christmas fabrics available, so this may be put aside for a while now until the right finishing fabric reveals itself - I had fun! I look forward to next month! It was an ordeal, but I can finally post/comment. I had to create a new account as blogger wouldn't let me post/comment! I am really looking forward to seeing everyone else's ornaments! I've sent invites to everyone that's asked and resent them to a couple of people who aren't showing up as being added at my end. So if you get two - that's why! We're over 70 stitchers now. Wow! What a monster Anne and I created! Hope you're having fun stitching this weekend! First off...thank you so much for getting me back into the loop Nicki....being "expired" is no fun =). 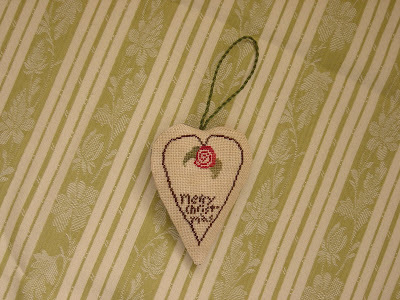 I finished this ornament from the Christmas Sentiments Volume 1 by Blue Ribbons Designs last weekend. I chose 32 count linen and it's stitched with Gentle Art Threads. What I didn't realize, until after I'd stitched the flowers in the middle and part of the border, were the numbers and letters are all stitched over one. Yikes!!! I've stitched over one on evenweave and aida before, but not linen. You know how linen has it's little "nubs" (for lack of a better word). I ended up doing a lot of frogging and being frustrated with this one. Had it not been for this SAL group I think it would have been something I would have started and then put down because it was so frustrating. Thanks for the inspiration. This is my third January ornament. published on a JCS Christmas Ornaments issue. I have used DMC Variations 4210 for the red, 4050 for the green and 4160 for the white. It was very quick to be stitched, and I have realized it yesterday afternoon. The back fabric is a Mumm Winter Whismy label pannel on green. I had the day off work today, so I thought I'd get a head start on the Stitch-Along for the weekend. My January ornament is from La Broiderie, and its called "Snow Glow". 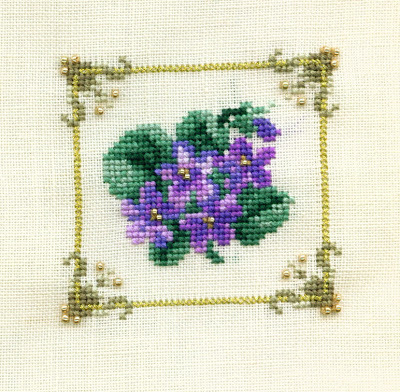 I didn't use the called for colours, substituting a Minnamurra thread, a purple Kreinik and some delicas instead. 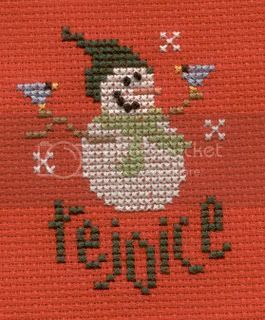 I still need to pick up the snowflake for the middle when I go to the needlework store next. 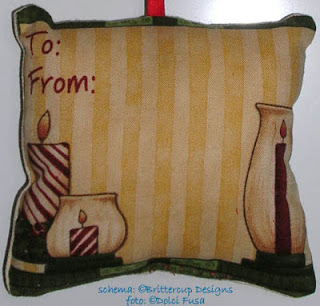 Tomorrow starts the fourth weekend of the month... but now that I finally got on new Blogger and can access this blog, I see that some of you have already stitched an ornament... duh to me! What happened?? Hi there :) I see I am not the only one who has done this ornament! It's so pretty. It's by Country Cottage Needleworks out of the 2006 JCS magazine. I still need to "finish" it, but I can do that later. I changed the timestamp to Greenwich Mean Time. We have almost 70 stitchers from 11 countries (I think) so at least GMT means something to all of us! If you can't post a photo and get a weird error code, try logging in through www.blogger.com, not beta.blogger.com. I had big problems yesterday but found this worked! Lovely pics everyone! Looking forward to more this weekend! 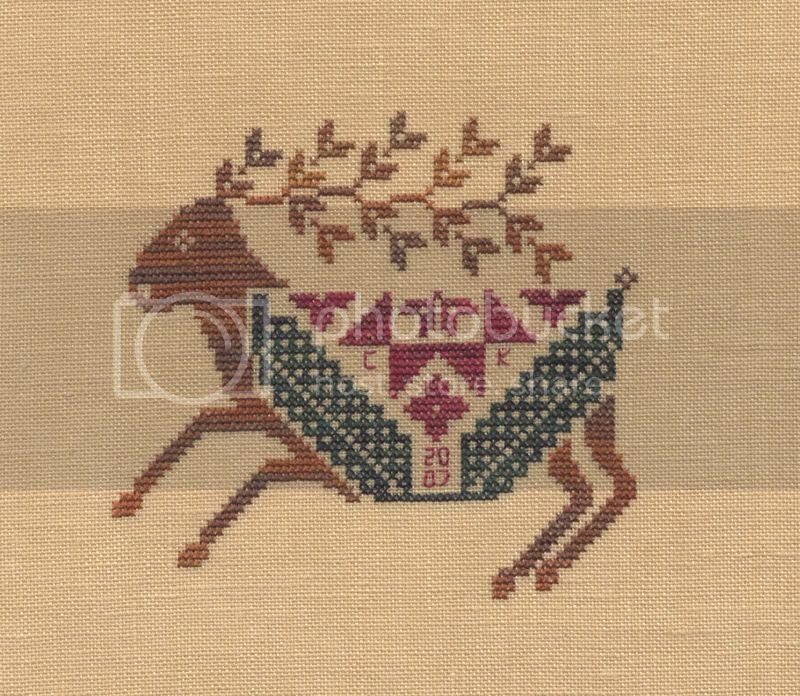 Here is my January ornament - Quaker Reindeer by The Workbasket which featured in the 2006 Just Cross Stitch Christmas Ornament issue. He's not quite as charted, I saw another Reindeer stitched like this on the Legacy Embroiderer's Guild Bulletin board and decided to copy. 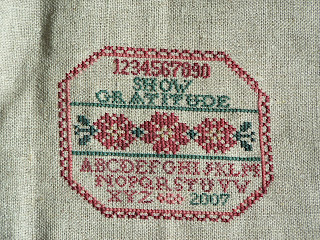 The Quaker medallion is stitched with Gentle Arts Sampler Threads in Blue Spruce and Cranberry. I used the called for Copper Waterlillies for his body. I had a look on the Workbasket site yesterday and they are planning on releasing a Quaker Cat and Mouse at the Nashville show. This is my second ornament. 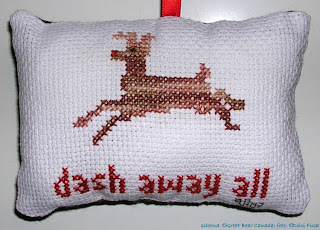 I stitched Dash Away All, a complimentary design from Great Bear Canada. I used 16ct white aida, DMC Variation 4140 for the reindeer and Crescent Colours' Chili Pepper for the nose and the phrase. I have realized it very quickly, yesterday night, and quilted it today; the fabric is a Debbie Mumm Home Fires Winter/Holiday. My first attempt at "designing" ornies! 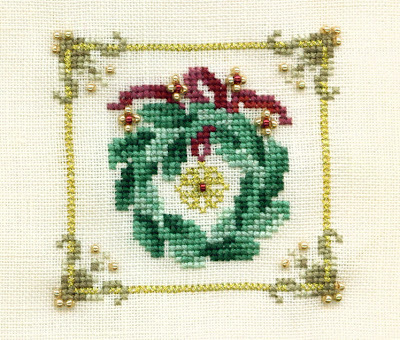 These ornaments were inspired by a photo that I saw in the "Cross stitch shop" part of a 2003 Better Homes and Gardens Creative Collections Publication called "Cross Stitch Christmas". I stitched them using 14 count red Aida, a silvery DMC thread whose tag went missing before I started the project and used a BHG book with a section on lettering to come up with the words: faith, hope ,love, peace, joy, glory. A red, white and silver ribbon found at Michaels and plain white buttons finished it all quite nicely. They all share the idental borders with gold beads. 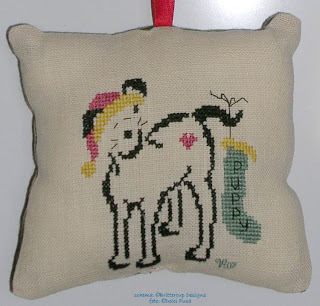 thi is my first finish of the new year: I stitched Britty Puppy Christmas, from Brittercup Designs. 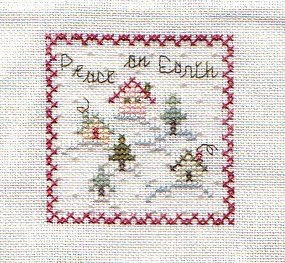 It has been published in the 2006 JCS Ornament issue, and it it the companion of Britty Kitty Christmas I have already stitched. I used a cream linen, DMC threads for the silhouette and the sock, GAST threads for the hat and the heart. I have completed the needlework on Friday 12th and quilted it on Sunday; the fabric is a Debbie Mumm Home Fires Winter/Holiday. Now I have to decide my next ornie! I have a few different projects going that need to be finished by the end of the month, so I also jumped in a bit early to stitch my January ornament. 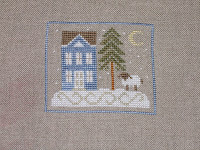 I stitched Winter's Eve by Country Cottage Needleworks. It's from the 2006 JCS Ornament issue. I stitched it using the suggested fabric (28-count natural Cashel) and fibers (DMC, WDW, and CC). It took just over 7 hours of total stitching time. 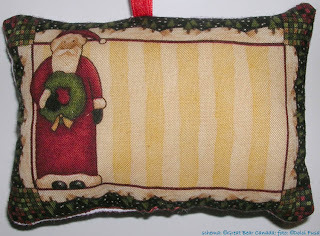 I'm doing a private ornament RR with a few of my stitching friends. This is the design I chose to kit up for everyone. Being in this RR and this SAL should really help me meet my goal to stitching more ornaments this year. I couldn't wait until the end of the month to post these..this is from 123 stitch on the free and fun page..I did it for a lady I know who is a breast cancer survivor...you can choose whatever color,depending on your cause.I did it over one.. I love the ornaments I have seen so far and can't wait to see more..
Christmas Ornaments on the Internet.